Thanks to an invitation from my friends, Maggie and Bill, I got to explore a new part of France last week. They were headed to the Gard department via the Cevennes and asked if I'd like to join them. You bet! 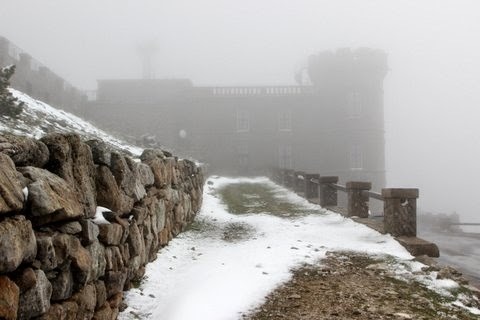 Our trip began in miserable rainy, foggy weather and with a decision to make. Should we travel via the Gorges de la Jonte, gambling that the weather would improve or take an alternate route? We gambled and won....kind of! While the skies were not blue and sunny, the Gorges de la Jonte was lovely. 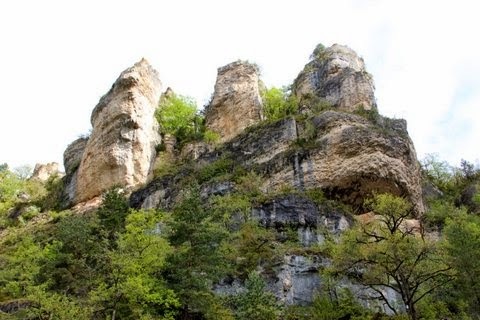 Not as famous as its neighbor to the north, the Gorges du Tarn, the canyon carved by the river Jonte is equally rugged and beautiful. The river is lined with tiny villages and dotted with abandoned mid-19th century factories that one time produced silk, wool and cotton textiles, and nails. 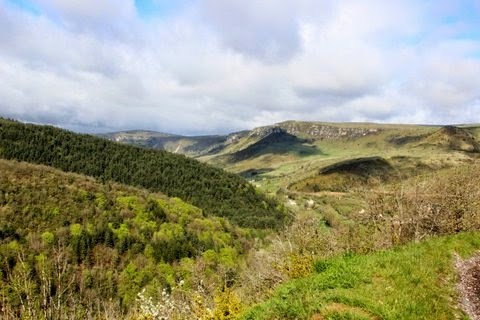 This area of the Cevennes was the historic home of a large number of French Protestants (Huguenots) who were alternately persecuted and welcomed by kings and revolutionaries. The canyon is a very popular destination for campers, climbers and bird watchers. The area economy depends of this tourism and agriculture for its existence. 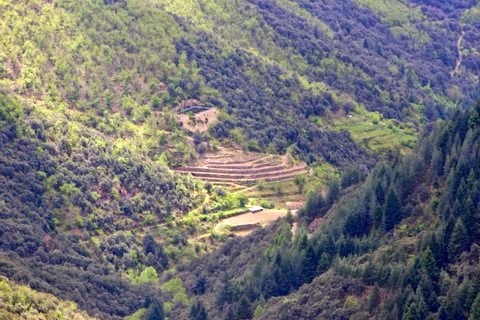 But as you can see from the photo below, agriculture is the result of back-breaking terracing; the steep hillsides are otherwise unusable. 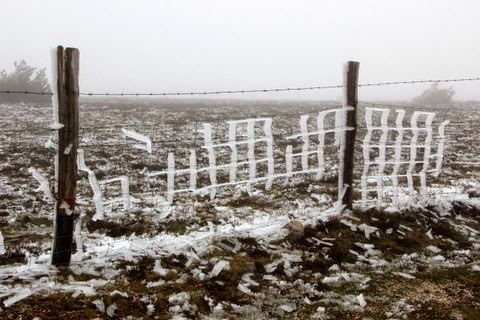 Snow, fog, a biting, ferocious wind making it difficult to even stand up, 1 degree Centigrade and ice! Maggie and I hopped out of the van long enough to snap a couple of photos and then shivered all the way down the mountainside. If you click through to the Wikipedia site about the mountain, you'll read that on a clear day you can see the Mediterranean from here. No such sweeping views for us! 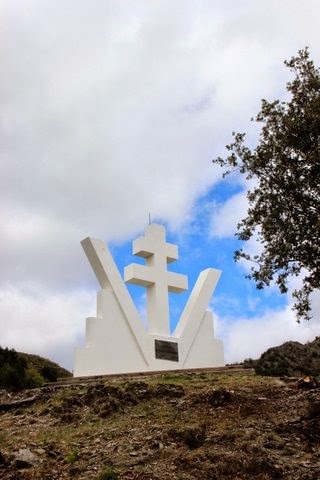 At a lonely intersection of two mountain roads on Col du Pas (833 meters), we found this huge Cross of Lorraine monument to the WWII Resistance fighters who hid in this wild area. You can see a peek of blue sky behind it. Was our weather improving? or would we spend the next two days shivering in the cold and wet? You'll have to read my next blog post to find out!